Use this image as a beginning guide to familiarize yourself with the ArcScene environment. Note that dockable window controls can be moved around the display to customize your view. 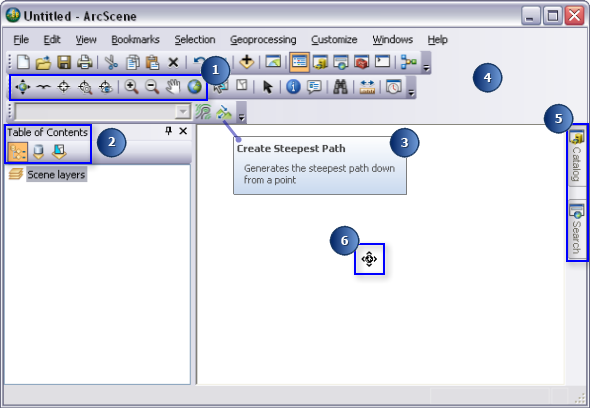 In addition, certain tools and options displayed here may be specific to ArcScene and therefore not available in other applications. The Tools toolbar includes several navigation tools used to manipulate the observer and camera target positions. These tools optimize interacting with the 3D view and your data. The table of contents has several ways of listing layers: by draw order, source, or whether layers are selectable. To list data by source will display the storage path above the layers. ToolTips are revealed when you hover over a tool on a toolbar. You can quickly learn the name and more about its capabilities. Access more toolbars to add to your view by right-clicking this gray area. You can also select or deselect toolbars from the Customize menu. Dockable windows collapse from the 3D view when not in use. Click a tab to expand. The navigation icon. This will change as you use different navigation tools to move around your data and 3D environment. There is no 3D globe surface provided in ArcScene.